The cities of Mercedes and Harlingen, Texas, located in Rio Grande Valley near the Mexican border, did not develop until the early 20th century. Known as “The Queen City of the Valley,” Mercedes was founded in 1907 after widespread publicity campaigns drew Northern settlers to the area. It flourished as a citrus fruit producer, reaching a population of 2,000 by 1915. When oil was discovered in Mercedes in 1935, its population increased to almost 8,000 residents by 1940. Harlingen, on the other hand, was incorporated in 1910 with just over 1,000 inhabitants. Its economy centered around agriculture, specifically vegetables and cotton. It became a distribution, shipping and industrial center as U.S. Highways 77 and 83 were completed, connecting Harlingen to the rest of Texas. As Harlingen surpassed Mercedes in both population and economy, Harlingen became a center of Jewish life for much of the Rio Grande Valley. Little is known about the early Jewish community in Mercedes. At least one Jewish man, Isadore Moritz, lived in town by 1908. Born in San Antonio in 1883 to Alsatian immigrants, he came to Mercedes to start a newspaper, the Mercedes Enterprise. It was the first weekly newspaper to be published in the Rio Grande Valley outside of Brownsville. Moritz was also instrumental in establishing the Mercedes Masonic Lodge and was himself the first Senior Warden of the Lodge. By 1912, after organizing lodges in Harlingen and other cities in the valley, he was appointed District Deputy Grand Master for the 40th Masonic District. That year, however, he moved to Brownsville. In 1927, Jews across the Rio Grande Valley established Congregation Beth Israel, which met in Mercedes. The congregation served Jews in 16 towns in the area, including Mission, McAllen, Weslaco, San Benito, Harlingen, Donna, Val Verde and Rio Grande City. Soon after organizing, the members pledged $400 a month to pay someone to serve as rabbi and teacher to their children. Hiring a spiritual leader was a higher priority than acquiring a building for Beth Israel. With about 250 Jews affiliated with Beth Israel, the congregation hired Daniel Harrison, a recent Russian immigrant, as their rabbi in 1928. He left his post one year later after being named principal of the San Antonio Hebrew Institute. In 1936, the congregation finally built a synagogue in Mercedes which catered to the estimated 315 Jews in the area. Joe Kirsh, Ben Levine, Ned Sondock. In both Mercedes and Harlingen, Jews, many of whom were Eastern European immigrants, became successful merchants. In Mercedes, Max Mestel operated the Electric Shoe Shop, while Max Hessel owned the Popular Store. H. Hartman ran the Big Store while Ben Golden owned a jewelry store. Other Jewish-owned stores in Mercedes in the 1930s included Brand’s, Swirce’s, Maxpol’s and Baum’s. As Harlingen’s population expanded in the 1930s due to its importance as a shipping and industrial center, many Jews took their businesses there. Abbish and Rose Adolph, two of Harlingen’s earliest Jewish residents, came from Baltimore in 1923 and opened a retail store, later called the New York Store. In 1934, Polish immigrant Ben Levine established the Man’s Shop. Sol Yudesis, a master upholsterer from Ukraine, opened San Benito Furniture Company and then S. Yudesis Furniture Company in 1927 in nearby San Benito. Charles Davis owned the Diana Shop, which sold ladies ready-to-wear clothing and operated for at least 42 years. Ned Sondock, who had come to Harlingen during the Great Depression in search of a job, opened an office supply store, Delta Office Supply. Harry Norton Greenfeld moved to Harlingen in the early 1930s, where he managed and eventually owned a dry goods business called the Economy Store. Polish-born Sam Feldman decided to move from Victoria to Brownsville in 1930, but ended up in Harlingen when his car broke down and deciding to stay. Feldman entered the wholesale liquor business in 1938 and eventually turned to retail liquor sales. By 1960, the Feldman family’s business had nine stores throughout the valley. Lee and Melvin Levy owned a TV and radio store. While Jews ended up in Harlingen for various reasons in the 1920s and 1930s, it was the opening of the Harlingen Army Air Field in 1941 that brought Jews and others in large numbers. As the city’s population soared to 23,000 by 1950, many Jews realized the business opportunities available in Harlingen. Both Joseph Braunstein and Nate Koppel sold life insurance. Brothers-in-law Sam Alexander and Max Shapiro were in the soda bottling business, with Sam owning the Hollywood Bottling Company and Max the local Pepsi Cola bottling plant. Isadore Moritz, who had moved again, this time to Harlingen, was the news editor at the KRGV radio station and then news reporter for the Harlingen Star. 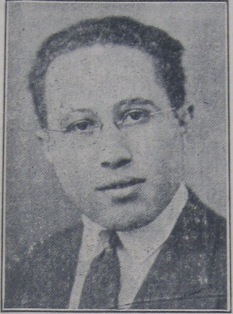 Albert Wolf established the AOC Welding Supply Company. In addition, Harlingen Jews had begun to enter the professions. Heinrich and Annie Lamm, a German couple, were both physicians – he was a surgeon and she was obstetrician and anesthetist. Marcel Bedri was a doctor as well while Dave Ruston was an optometrist. Nate Koppel’s son Rollins became a successful attorney and banker as well as an important leader in both the Jewish and larger community. By 1948, it was clear that the Jewish population of Mercedes was shrinking while its neighbors McAllen and Harlingen were thriving. Members of Beth Israel from McAllen and Harlingen met separately in October 1948 to decide the future of their congregation. The McAllen group had decided to form their own separate congregation and had already begun constructing a synagogue. The two groups agreed to dissolve the Mercedes congregation and form two, separate congregations – Temple Emanuel in McAllen and Beth Israel in Harlingen. The temple in Mercedes was sold to a church, with proceeds from the sale and the remaining assets divided equally between the two new congregations. McAllen’s congregation paid $250 for the Mercedes temple’s pews, chairs, Torah, dishes, cutlery and tables. Between 1948 and the 1951 dedication of the new synagogue in Harlingen, Beth Israel met in various places, including the barracks of the Harlingen Air Force Base, where they conducted Reform services and Sunday school. 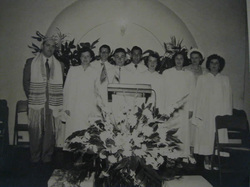 Despite not having a permanent building, Beth Israel still managed to hold a confirmation ceremony in 1950. Rabbi Yonah Geller of Corpus Christi's B'nai Israel Synagogue conducted the ceremony that year. 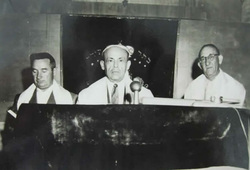 On June 24, 1951, Beth Israel's temple was formally opened and dedicated, with many members of the Rio Grande Valley’s religious community – Jewish and non-Jewish – participating in the festivities. Ministers from four different churches in the area gave their prayers while representatives from both Brownsville and McAllen’s Jewish congregations addressed the crowd. Rabbi Geller gave the address “The Role of Religion in Modern Life.” At the time of the synagogue’s dedication, the congregation’s membership totaled 34 households, representing 63 adults. The Harlingen Air Force Base reopened in April 1951 with the start of the Korean War. As a result, attendance at Beth Israel’s services was significantly higher than membership records show. In 1953, the congregation hired Rabbi Adolph Phillipsborn, a retired rabbi from Vicksburg, Mississippi, for $150 a month. Unfortunately, due to health issues, he was forced to return to Vicksburg in 1956. After his departure, the congregation was never able to hire a full-time rabbi. Often, student rabbis from Hebrew Union College or visiting rabbis from McAllen or Brownsville conducted services. In 1956, two rabbis from the Air Force’s Chaplain School in San Antonio conducted Beth Israel’s High Holiday services. Occasionally Rabbi Sidney Wolf from Corpus Christi’s Temple Beth El visited as well. In 1954, the Jewish community acquired their own burial grounds at Restlawn Cemetery, located between Harlingen and La Feria. With its membership growing to 100 households in 1960, the congregation built a Sunday school addition the following year, complete with four classrooms and a recreation room. However, when the Air Force Base was permanently closed in June, 1962, the temple lost many members and regular participants. Not only did those who were associated with the base leave, but as the local economy was hurt by the closure, some civilian members left to seek better economic opportunities. Eventually, there were not enough children to continue offering Sunday school, forcing those left to take their children to McAllen or Brownsville to complete their religious education. Nevertheless, the congregation remained active. Its Sisterhood organized community seders, Chanukah and Purim parties, and hospitality for student and visiting rabbis; the Sisterhood also held an annual rummage sale. Harlingen Jews have been active in the city’s civic life. Sam Alexander served as a city commissioner from 1953 to 1959, as did Lewis Levine from 1972 to 1974. Both Henry and Charles Feldman were presidents of the Harlingen Chamber of Commerce. Jerry Sondock, Mal Kasanoff, Albert Wolf, Jr. and Lewis Levine all served on the Airport Board. Rollins and Amalie Koppel founded the Rollins M. and Amalie L. Koppel Foundation, sponsoring many charitable projects in the community. For its 100-year anniversary, Harlingen created its Walk of Fame, honoring its 100 most influential citizens. At least eight were Jewish – including Sam Alexander, Charles Feldman, Mal Kasanoff, Rollins Koppel, Annie Lamm, Heinrich Lamm, Ben Levine and Lewis Levine – illustrating the great impact Jews have had on the city. After over 50 years of wear and tear and following damage from Hurricane Dolly in July 2008, Beth Israel undertook major renovations of their temple. Insurance covered the replacement of the pews and wood paneling that were damaged by the storm. Fundraising – especially the generous donations from the Koppel and Wolf families – paid for the rest of the improvements, including a new roof, new plumbing and electrical fixtures, new carpet, and remodeled kitchen and restrooms. The former school building was renovated as well, allowing Sunday school classes to resume. Due to the efforts of congregational leader Fernando Russek, the Beth Israel religious school was reorganized, and in 2011 had about 25 students. On December 11, 2009, the congregation celebrated a rededication of its temple. In 2011, the congregation had about 100 members; Rabbi Frank Joseph conducted services one Saturday each month, as well as High Holiday services. A handful of Beth Israel’s members, interestingly enough, are Mexican converts who believe that their ancestors were Jews who were forced to convert in the wake of the Spanish Inquisition. Converts have played an important part in Beth Israel’s continued vitality. Harlingen’s overall population is growing, increasing over 12% since 2000, and the remaining Jewish community is optimistic about its future.